Making a vegetable to go along with dinner for my meat-and-potatoes-loving BF is often a real challenge. He’s just not a fan of most things green. And when I asked him last night, “Do you like edamame?” he made a face. But um… then I tricked him. Haha! Tricking someone into eating vegetables. I’ll be a great mom someday. This salad has lots of good stuff in it but it’s so fresh and sweet tasting, the best of the best ingredients are all but hidden. It should also be noted that fresh corn would be WAY better in this salad than frozen. But it is obviously not corn season yet so this will have to do. In a small saucepan, add corn and edamame and cover with water. Add a pinch of kosher salt. Bring water to a boil and then lower to a simmer. Cook for approximately 8 minutes. Remove from heat, drain, and let cool. Meanwhile, in a small bowl, whisk together the olive oil, vinegar, and lime juice. Add a pinch of salt and pepper. 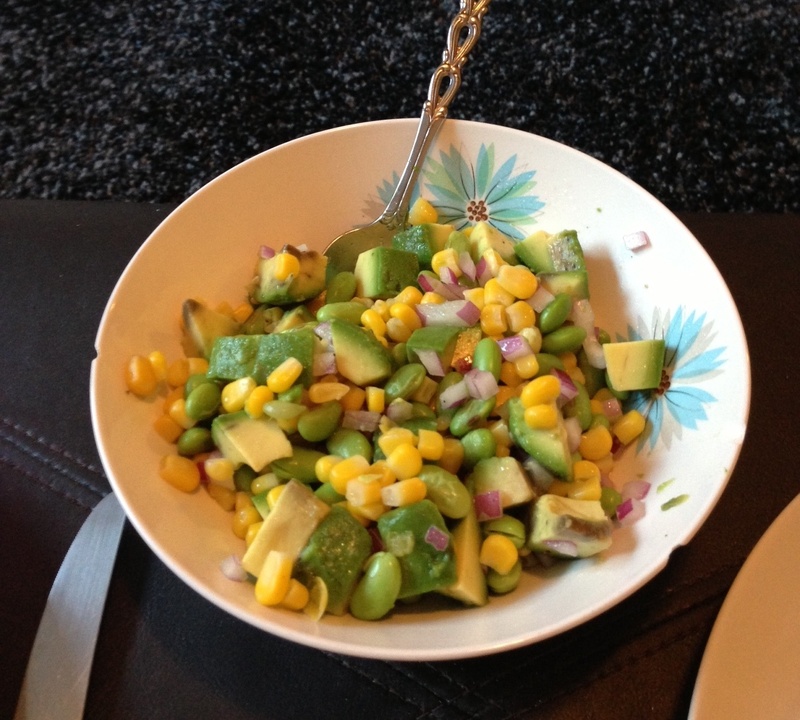 In a small serving bowl, add cooled corn and edamame, red onion, cubed avocado, and dressing. Toss to combine.